Rituals and traditions help define family and community. They make our lives feel meaningful. You can probably remember something in your own life that feels so distinctive you might be able to smell, taste or see it right now. In the lives of the children at the Maria Montessori School there are many traditions that the students look forward to every fall semester: The Middle School Odyssey trip, the Elementary 2 camping trip, Historical Halloween, and The Winter Festival. It bonds the students together remembering these special events year after year, laughing about funny stories, and wondering what next year may bring. Students at the school perform daily and weekly rituals such as the community song in primary and the lunch gratitude in elementary, putting up and taking down the flag, having community meetings, or sharing a special snack. 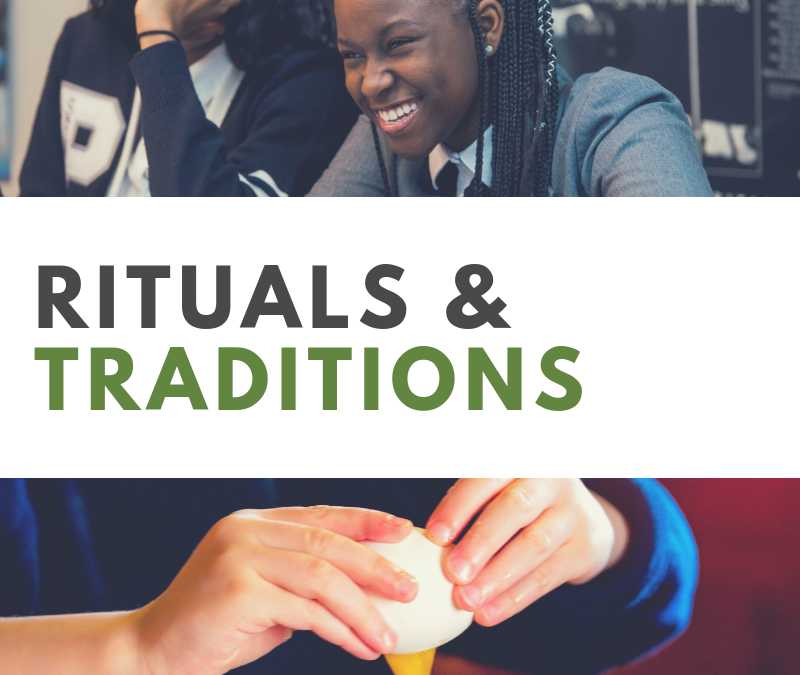 As the weather cools and the holiday season grows nearer, there is no better time to begin thinking of some rituals and traditions for your own families. For the younger ones, it can be as simple as lighting a candle and saying gratitude. Also involving young children in cooking a favorite family recipe makes them feel important and valued. (Hint: they are more likely to try a new food if they make it!) For older students, it is nice to begin a tradition of giving back to the community. This gives the students a chance to practice using the gifts of compassion and resourcefulness that they have received in their Montessori education. Maria Montessori knew the importance of the child understanding their place in the universe. She knew the impression that a special ritual or tradition can leave on a child’s heart is very special. She said, “The things he sees are not just remembered; they are part of his soul.” The rituals and traditions we begin with a young child are more than future memories; they are like seeds that grow into our deepest understanding of ourselves. Enjoy your holiday season and let joy fill your heart. I am a mother of two children at the Maria Montessori School. I started my Montessori career in Houston, Texas. After completing my AMS elementary training, I began work at a public Montessori school as an Elementary 1 guide. When my husband and I moved to Memphis, I began working at The Maria Montessori School as an assistant in the Primary and later Elementary 2. Working in three different environments has given me a deep appreciation of the many benefits to a Montessori Education. I am forever grateful for the love and support that surrounds my children at this school.